This is bottled in 2011 and comes from fresh and refill Bourbon barrels and finished in Sherry casks. The peat is intense! Warm feeling with hay and grass in the smell. Hints of dried fruits as well, with some light orange peel. The heavy peat makes it feel stronger than the 46 %. The taste is powerful, peaty with a touch of different vegetation and slightly fruity. The flavours is strong in the finish as well, but lingers out in a soft sweetness. Caramel and syrup. I wouldn’t put this on a pancake though! Or would I? 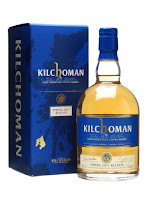 This is classic Kilchoman. Heavy peated farm whisky and everything you expect (and like) about a young Islay whisky. It is not very complex but I have tried many older Islay whiskies with far less complexity than this. I will give this 86/100 (21/22/22/21).